I love digital. Not because all things online are considered de rigueur these days, but because it is finally hammering home to marketers that it’s not what your ad looks like that matters, it’s what it says, how it says it and how that connects with your consumer. The digital world calls this consumer-centric advertising “content marketing.” Many, like me, who’ve believed in content marketing for a while (and have employed it successfully for more than 20 years in more traditional media) call it branded content. But whatever you call it, consumer-centric advertising is becoming the new creative model, because it works better and costs a lot less than the traditional TVC model. And that shift is putting a heap of pressure on the hoary old brand ad. Increasingly, marketers are beginning to understand what content marketing is and why it works. Basically, if you show the consumer what’s in it for them, you give them a reason to buy. And they will. But despite growing awareness of its power, many focused on traditional media continue to lag behind, holding on to an outmoded belief that creativity conquers all. Content marketing is governed by a completely different set of rules, which is what makes it so effective. It’s not focused on the brand, it’s focused on the consumer. And that’s a huge shift in dynamic. Advertisers can no longer simply pay lip service to forging a relationship with their consumers, because that simply doesn’t work and marketers are wising up to it. Back in 1960 Theodore Levitt published a paper in the Harvard Business Review entitled ‘Marketing Myopia’ that’s now recognised as an industry classic. In it he talks about the decline of the US railroad business, not because the need was filled by trucks and planes, but because the US railroad industry remained stubbornly railroad-orientated instead of transportation-orientated. It failed because it remained transfixed on its product, rather than on its customers’ changing needs, wants and desires. In traditional media like print, content marketing is more commonly known as advertorial. That’s been around for years. But today the line between editorial and advertorial is becoming increasingly blurred as the print industry looks for new sources of revenue. In television it ranges from 100 percent advertising-funded programmes such as Telstra Business or (for those who can remember) Air New Zealand’s Holiday programme; to mini-programme ads, such as Food in a Minute and BrandWorld’s Family Health Diary, both of which are fully supported by their own cross-media marketing programmes, making them media platforms in their own right; to sponsor integration into reality programmes. A great example of content marketing on television today is drinks’ company Lion’s ‘Made to Match’ series, which matches its range of speciality brews with food cooked up by celebrity Kiwi chef Al Brown. The series built on the success of Lion’s late night cocktail tutorials, The Mix. Both were produced by BrandWorld and TVNZ in collaboration and both offer Lion the opportunity to showcase several products (with limited budgets on their own) in a top notch, highly engaging way. But, more importantly, both give consumers a reason to buy the products and something interesting to talk about with their peers, which in today’s connected world is money in the till for brands. Making engaging content that people want to talk about is all in a day’s work for journalists and programme makers, but it’s often missing in the skill set of traditional advertising agencies. Really good content marketing, however, needs to employ both sets of skills: the ability to tell good stories that resonate with consumers and the ability to weave those stories around brands in a seamless manner. The other important difference with content marketing is that it’s 100 percent results driven. If what you’re saying isn’t relevant to your consumer, you can tell immediately from the sales results. Creative can be amazing or it can be useful. The customer wants useful. They want a reason to buy. But this focus on consumer centricity and resulting sales is one of the main reasons why traditional advertising has shied away from it, despite overwhelming research showing how effective it is. Most advertising creatives are frustrated movie directors, artists or novelists; they want to be creatively free and have stubbornly resisted any attempts over the years to assess their outputs in terms of sales. This problem has been perpetuated by the industry, which hands out awards based on creativity rather than sales results, and outmoded market research methodologies, which favour awareness and brand image over whether a campaign actually increases a consumer’s propensity to purchase. For most in the advertising industry the reward is not increasing their client’s sales by 100 percent—and I’ve seen up to 400 percent increases in sales from good content marketing campaigns—but what their peers thought about their creativity. Just imagine then asking these traditional creatives to also put their client’s packaging front, centre and at the end of their creativity so consumers recognise it when they are shopping. Horrors! There’s also a great deal of budget wasting in traditional advertising. Big brand ads are expensive to make. They might be beautiful, memorable and highly entertaining, but do they make you buy? Research shows all consumers suffer from “wear out” where an ad simply doesn’t get any more traction after it’s been shown ten or more times, however entertaining it is. Propensity to buy also peters out after an ad’s been shown five or six times. So while a good brand ad might do an excellent job of creating awareness and an image for a brand, once that’s created, why repeat it year after year? Why not build on that investment and give consumers a reason to buy the product. The advantage of content marketing is it can be refreshed time and time again far more affordably than traditional advertising. Marketing has lost a lot of credibility with senior management over the years with this unwavering focus on brand image building rather than generating sales. But with the rise of digital the tide is finally turning and sales results are again becoming a powerful measure of success across all media. We’re even beginning to see some enlightened marketers put objectives like “increase market share by 20 percent” and “increase sales by 30 percent” into their briefs, which is excellent news for the industry as a whole. In the past marketers have tended to be mesmerised by the creatives in their agencies. This hasn’t been helped by our marketing courses, which continue to teach old, outmoded models focusing on brand image, not consumers or consumer activation, and the industry failing to read and understand the mass of research that abounds on the subject. Also, marketers often simply don’t understand their target audience. I see many campaigns targeting, say, a 30-year-old household shopper versus a 45-year-old household shopper, even though they know the 45-year-old shopper has far more disposal income and is the purchaser of 70 percent to 80 percent of the product being advertised. This is based on product managers’ assumptions: firstly, that they are the target audience and so, they reflect their own peer group, and secondly, their 45 plus-year-old has been marketed to before and is therefore still brand and product loyal. But research clearly shows the 45-year-old shopper is less brand and product loyal than the 30-year-old, because they’ve become more discerning. So your 45-year-old target is actually your biggest opportunity because they are not loyal to your competitors’ products either. Like traditional marketing and advertising campaigns, good content campaigns are still based on a big idea. But in content marketing that big idea comes from having good consumer and trend insights, strong marketing expertise and an understanding of what makes a good story, which takes a range of skills. Then you need the skills to package it well and distribute it in a way and at a time when your target consumers are not just around to hear it, but want to hear it. So it requires a team of people with different skill sets to those normally found in an advertising agency. And it’s certainly not just about one creative genius in the room any more. There will always be a place for some form of brand advertising, but it’s finally being recognised as just one tool of many. Digital has opened Pandora’s Box and for the first time marketers and their communication partners are questioning the old rules and some of the gold-plated standard responses are looking extremely tarnished. The big expensive TVC, which is filmed to last for a couple of years and has one unique selling proposition, is in sharp decline. Consumers today want multiple stories because they are responding to ever-changing stimuli. Marketers and advertisers have to learn to be more agile and effective with what they produce if they are to survive and the old brand advertising model in many cases simply doesn’t do that any longer. Research has shown that the most powerful way to communicate with consumers is through audio-visual (AV), whether that’s through television or online video. And in some cases it has proven to be up to ten times more effective than text and pictures. Television is particularly powerful in New Zealand because there’s still such limited choice so it’s able to combine AV with mass audience reach. So you can reach a large audience in New Zealand more cost effectively than anywhere else in the world. That’s not going to be with us forever though, so while it’s here, marketers should use it. With the lower production cost of branded content—because it uses programme maker knowhow, not advertising-creative knowhow—and the increasing availability of narrow cast sites (both on TV and online) focused on particular genres such as food, a video campaign can now be cheaper than campaigns in other media. Good branded content allows advertisers to place multiple bets against different target sectors at the same time. Content can be filmed once and then repurposed for use across a variety of different media. This automatically ensures message integration and, when it’s done effectively, can be very powerful. But it’s not easy. Marketers have to know their consumers and their research to really understand what might interest them. To be really effective, you need to know your consumer better than your spouse. Today’s media rich world is far more complex than in the past. But the vast array of choices—and the different ways they interact—offer marketers a far richer and more exciting tool box than they have ever had before. Unfortunately today, too many TV commercials are still simply big and expensive executions posing as good ideas. Thankfully, that’s changing. Good content marketing is anything that seamlessly integrates brands and consumer needs, says Mike O’Sullivan, executive director of BrandWorld. And that’s why really good content marketing is often invisible. He says one of the best (and oldest) forms of content marketing is music videos. Red Bull has also made content marketing an art form, seamlessly integrating its brands into adventure sports by making its name synonymous with everything it wants the brand to stand for and then creating a plethora of content—TV shows, event coverage, an international magazine, a man jumping from the edge of space—to take its message to the world. Other shows embracing integration include Chelsea Sugar’s Hottest Home Baker, MasterChef and The Block NZ, with the sponsors often building tailored marketing programmes around the show. Two of the most popular contestants on the first season of The Block, Rachael and Tyson, were regular users of Kiwibank’s specially-designed online budgeting tool RenoMate. At the time, Regan Savage, Kiwibank’s head of brand and communications, said: “You can’t make a TV ad for everything, so showing our products and services completely integrated in a really natural way was a real highlight.” MasterChef’s main sponsor Countdown was also glowing about its involvement in the show, but TVNZ admitted it went a step too far in series two when commercial interests trumped editorial interests and one contestant was forced to rush to the nearest Countdown store to get an ingredient. But integration is increasing, and many TVNZ clients are pursuing it, says O’Brien. The challenge is finding the right property. Reality formats lend themselves to it, and while shows like X Factor NZ and NZ’s Got Talent don’t offer as many opportunities for integration, they are aspirational and offer sponsors big audiences for programme extensions. Overseas things have gone further, with digital wizardry inserting logos into the background of drama series. It’s only a matter of time before we see something similar here, O’Brien says. O’Sullivan says content marketing is on the up because it’s a win-win-win: programme makers can afford to make the programmes they want while media owners achieve the revenues they need; consumers are given a product they enjoy with information they can use; and companies get a highly visible vehicle that gives consumers a good reason to buy their products. ​Mike O’Sullivan is executive director of BrandWorld and, together with his colleagues, he has led the content marketing charge with the TV-led multimedia marketing platforms like Family Health Diary, Discover, Eating Well and a host of bespoke offerings. 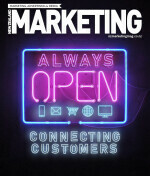 This story originally appeared in the September/October edition of NZ Marketing.